well hello there! happy new year! we are starting our new year with a bang, i have three out of four of the noisemakers home from school due to a little bug they've managed to pick up from...yup you got it, from the only kid that made it to school today. i've so far have managed not to get anything probably because i have 409 in my blood system and i use Lysol for deodorant and hairspray...knock on wood. but i think i paid my dues a few weeks before Christmas. here's to holding my breath...okay so i promised a while ago a few more before and afters of the house. 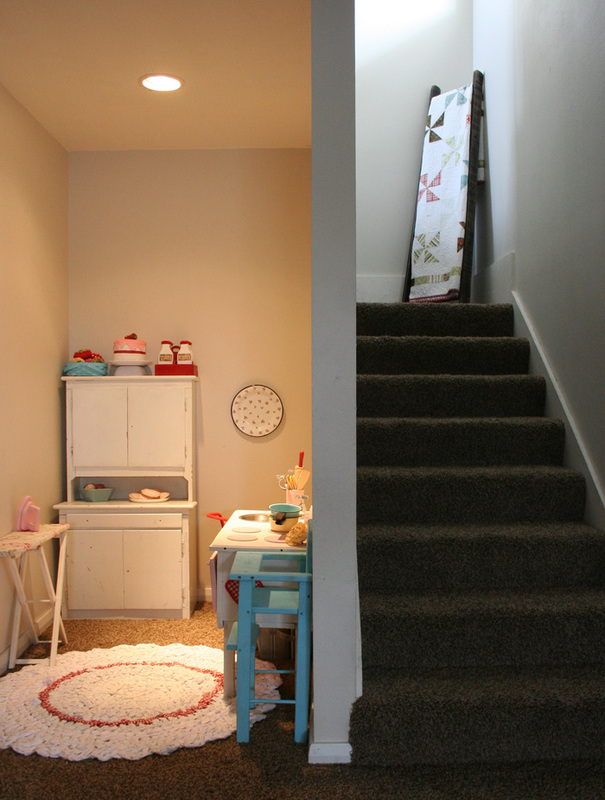 keep in mind nothing has been bought for the downstairs, so it's a hodgepodge of things. someday maybe yes, but for now we are good with what we have. the couches were free (left with the house, whoot!) the rug and the star were in the boys' room before i changed it to star wars themed. 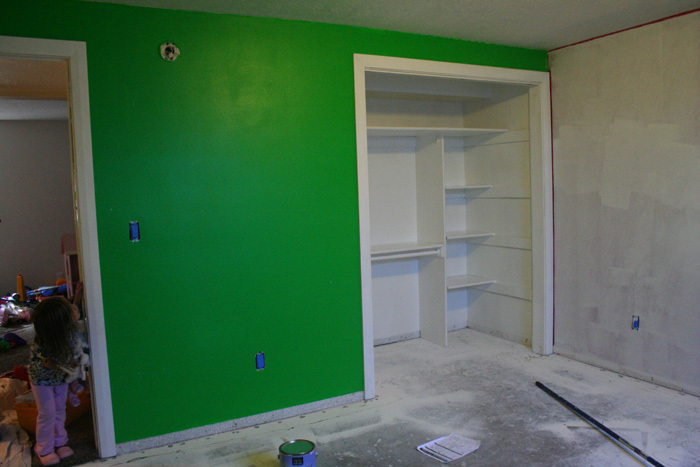 one of my favorite things of this room besides it being big and downstairs, is it's closet with shelves. 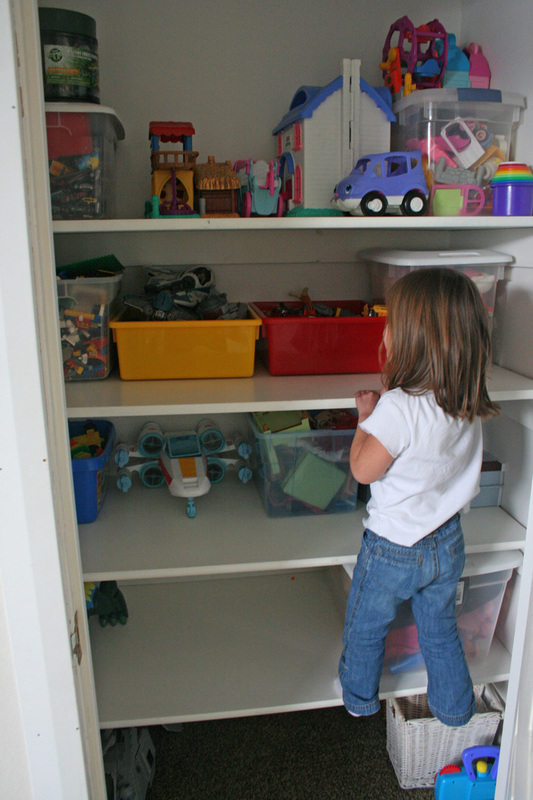 i spent part of my vacay with the kiddos home organizing their toys and closets. i don't know if it was a good thing because when we got it all organized the boys kept looking at it and kept saying "we really don't have a lot of toys." i guess when things were just being shoved in there it looked like a lot more. my answer was "nope we just have a lot more room now. and anyways, less things means less to clean up." that got me some dirty looks. whatever, water rolling off my back. i still want to have a more "pretty" system for the organizing in the closets but that will take a little more planning and sewing than what i have on my hands right now. 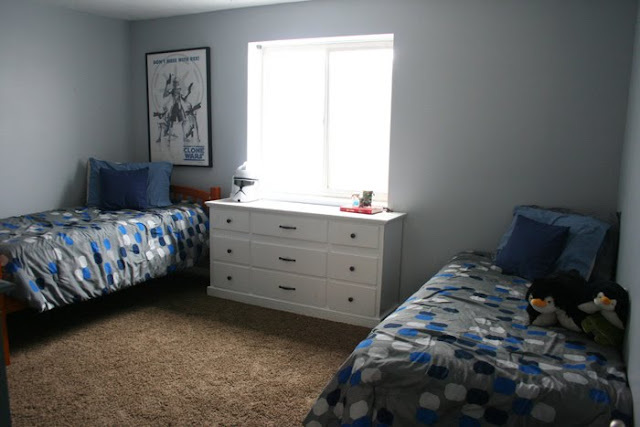 the downstairs has three bedrooms...if each of the boys wanted their own room they could have it. 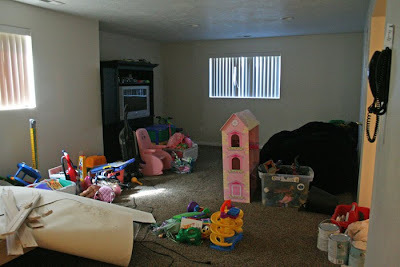 this one's noise maker #2's room, and yes, it usually always looks like this without my help. i went with a really light gray for the both room's walls. i'm not a huge fan of dark colors in general for walls, and plus it being in the basement with some light but not a ton... this color was perfect. and of course you can find the vader poster here. oops i guess they are currently out of stock. but it's a good one so you might want to check later. okay that's it for me right now. i have to take care of sickies. and i need to explain that for this next 2 months my blogging will be shotty here and there. oh i'll pop in and i still have some tutorials i want to share... but i have some "things" i have to take care of and i'll be trying to focus mainly on those. you'll soon find out what they are. ;) have a smashing good week, till we talk again! WOW! that is an incredible transformation. I love the Vadar was framed poster.lol! Those are awesome! Way to go! 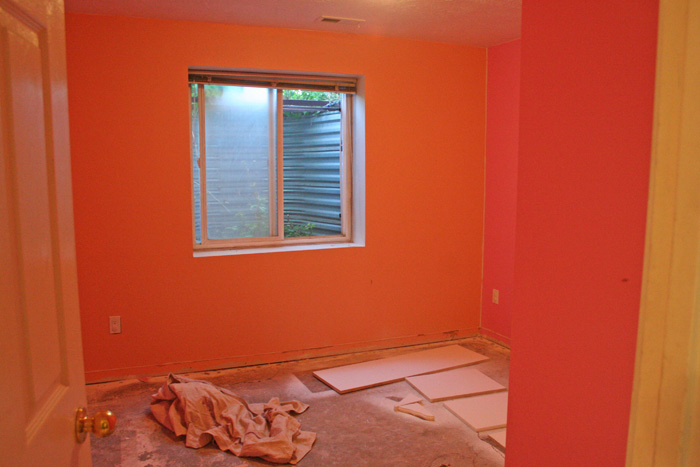 the previous owners loved bright colors. I love the new color pallet. very calm. 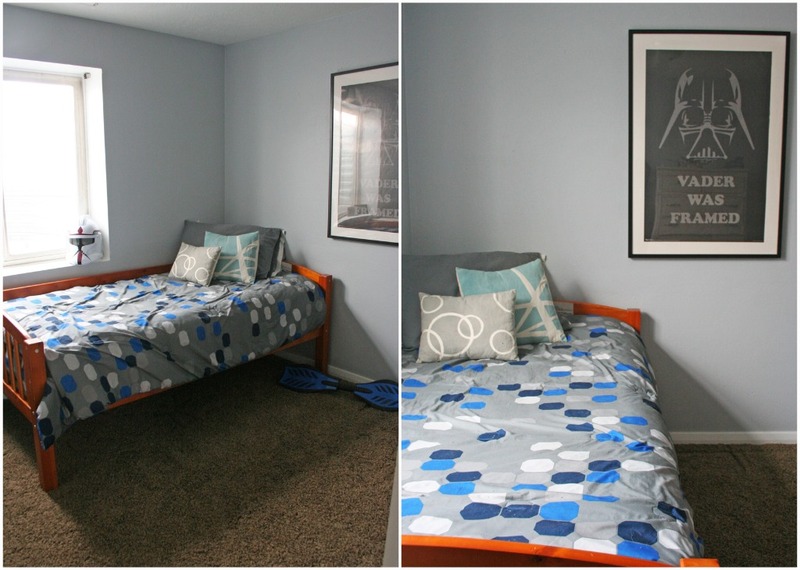 LOVE the transformation in the boys rooms. I have a few flight training maps if you would want to try and use them instead of an Ikea map. Let me know. very nice vanessa. :) and have fun with those things! When you have your hubby make that fridge ;-) be sure to use a metallic primer under your paint. It's about $25 a can but really, what kid wouldn't want to be able to use magnets on her very own fridge?!? Wow! Those were some bright colours you had to cover up. I like yours much better. I'm always amazed at how you manage to keeps your and your kiddos stuff organised. It took all day today to tidy just ONE bedroom in our house. By the time we were finished we were too late to donate the stuff so it sits in the family room for another day. What's the name and brand of paint you used? It's looks great! I bought the same bedspread for my son and we just haven't gotten around to painting over his navy blue walls yet. Good luck with your sickies. Everything looks great! Wow, there were some bright colors before! So much nicer now. 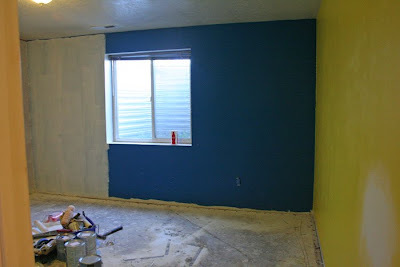 I love the color you chose for their rooms! It's so light and great! They look so good, I think I'm going to have to adopt the "must be clean before bed" rule! If you're looking for a poster, I'd check with your local theater and see if you can have any of the old ones that they take out of the window displays. They usually just throw them out or give them to their employees anyways. I have gotten a few this way. If not the theater, then maybe a store that sells or rents out movies. Those before pictures are really bright. Yikes. Love what you've done- especially Katie's kitchen! What a great use of space for Katie's kitchen! (you could make a sign for her kitchen to hang above the stove? "Katie's Kitchen"?) And ummmm, wow! I wish our previous owners left us some amazing couches like that! It looks like you're really settling in! You could put a REAL fridge in Katie's Kitchen! Then again, maybe you don't want gatoraide all over the new bedrooms! Wow. The previous owners sure were not afraid of color! But not really in a good way. After is MUCH more conducive to actually sleeping! 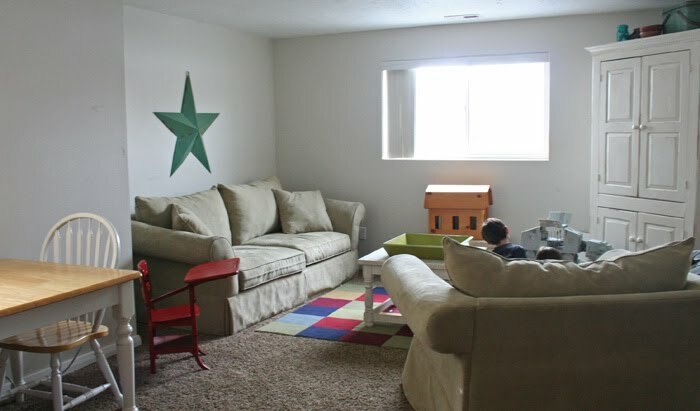 And I love that family room. Very soothing. Looks great, I am not jealous at all that you have your new house already looking gorgeous and my not so new house looks like a bomb went off!!! What is up with the paint colors in that town? The afters look lovely. And nice organizing! I hope your kids get better. Mine have strep and we're not home yet. Fab transformations V! 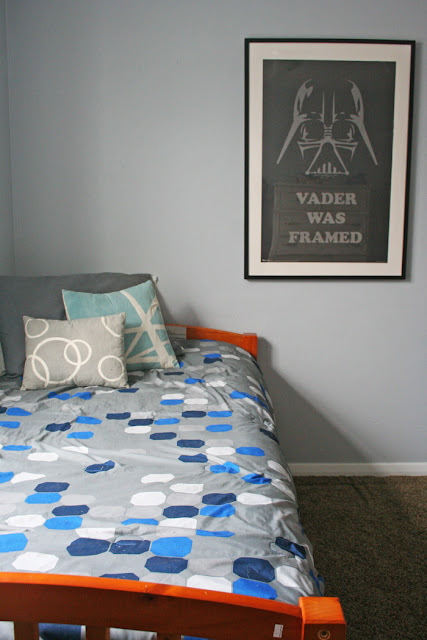 That Vader poster is hysterical -- if I had little boys I'd definitely want one! I too love the Vader was Framed picture, but mostly I heart the toy shelves. I heart them very much. It's not quite as big but maybe it could be useful???? Love the transformations by the way! Especially Katie's Kitchen!!! I just found you and I'm in awe of your redo! Beautifully done!!! P.S. I LOVE the EAT in your kitchen! The basement looks great. What a differnce paint makes. I love the gray and have wanted to paint my kitchen gray but can't find the right shade. What did you use? i used best do it paint and it's called "mc cloud" it's the perfect gray!!!! !